January 2010 – My Story – ISB and beyond !!! News Flash: Mrudangam legend Umayalpuram Sri K. Sivaraman (my guru) has been named today as one of the recipients of this year’s Padma Vibhushan award, the country’s second highest civilian honour! ISB ranked no. 12 in FT’s Global B-School Rankings! The Indian School of Business (ISB), my alma mater, has been ranked no. 12 in the latest Financial Times (London) global B-School rankings! Way to go! The Indian School of Business (ISB) has been ranked No: 12 in the global B-school rankings released today by the Financial Times, London. This is the third successive year that the ISB has featured among the top 20, in the list of top 100 B-schools in the world. Previously, ISB was ranked 15th in 2009 and 20th in 2008. “We began with the idea of creating a school in India that would rank among the best in the world. Today, I am delighted that the ISB is consolidating its position as a top-ranked global business school. To receive this news on the eve of the completion of 60 years of the Indian Republic makes it all the more special. I congratulate the entire ISB community on this success” said Rajat Gupta, Chairman, ISB. The ISB was established in 2001 with the launch of its pioneering Post Graduate Programme in Management (PGPM). From an initial class of 126 students, the school has grown successively over the years, and currently has 570 students in the class of 2010. The school has over 2300 alumni who are making a strong impact in business and industry. The school has also established itself as a leader in Executive Education through its programmes designed and delivered for private and public sector corporations, small and medium enterprises, and central and state governments. The ISB faculty research papers are consistently published by top ranked peer reviewed international journals. After a successful first phase of growth, the ISB has now entered its second phase of growth and expansion. It recently launched its second Post Graduate Programme in Management for Senior Executives (PGPMAX), which has generated a lot of interest among senior business professionals. It will soon set up its second campus in Mohali, Punjab. The first academic session at the ISB campus in Mohali is expected to commence in 2012. Chetan Bhagat’s “2 states – the story of my marriage” (Fiction, Rupa & Co., Oct 2009), said to be inspired from happenings in his own life, is a story of how two IIM-A classmates – Krish Malhotra (a Punjabi boy) and Ananya Swaminathan (a Tamil girl) fall in love with each other but have to deal with the problem of their parents not agreeing to their marriage. Though the plot is very predictable and very much like the way most Bollywood movies would tackle such a subject, Chetan kept my attention throughout with his simple, witty writing. Having lived in the north (with many Punjabi friends) and by virtue of my living now in Chennai, I could relate to a lot of things Chetan has written. Given that Chetan’s books usually come across as apt material or as inspiration for movie scripts, we will have to see if a movie is made out of this one. Or may be he wrote the book with a movie project in mind/ already signed. 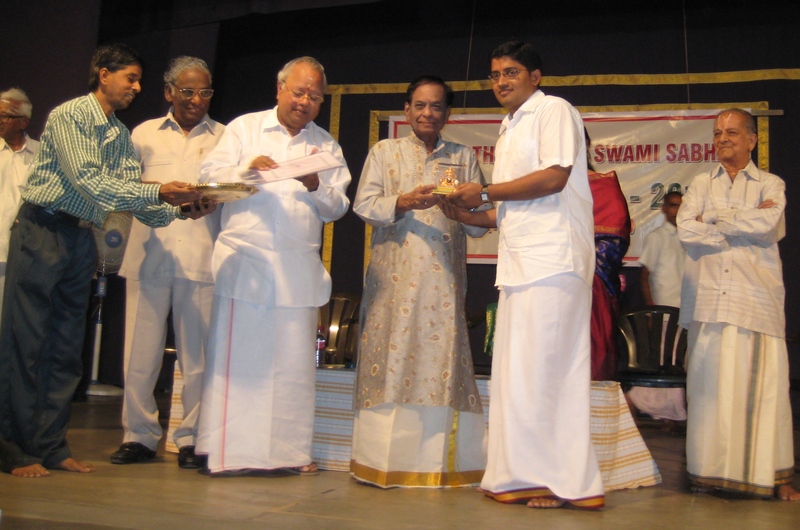 It was very encouraging today to get the best mrudangam artist award for this year’s music season (afternoon slot) from Shri Parthasarathy Swami Sabha, one of Chennai’s oldest and most reputed sabhas. 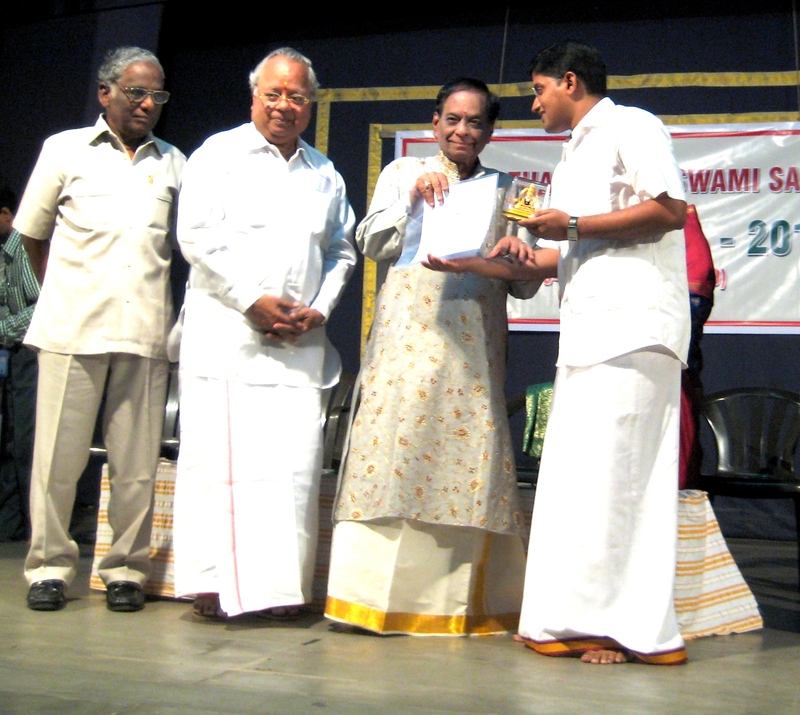 The award was given by Carnatic music legend Dr. M. Balamuralikrishna and Dr. Nalli Kuppuswami Chettiar. The book also comes along with a CD that contains 27 tracks performed by some of the artists covered in the book. The target audience seems to be people looking for an introduction to Indian music and its maestros. It could include people who are new to one or both systems of Indian Classical music (Carnatic and Hindustani) and need help in identifying whom to and what to listen to. The book is certainly not a collection of biographies or a detailed account of what constitutes Carnatic or Hindustani music and anybody reading the book with such expectations is bound to get disappointed. December is the month many Carnatic music lovers, look forward to, for it is in December that the annual music season begins. It’s really saddening to see the season draw to a close. But as they say, all good things must come to an end. Let me take this opportunity to wish you all a great year ahead!